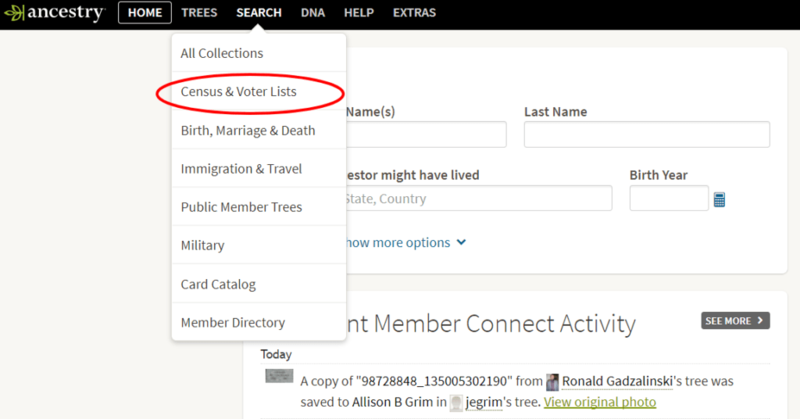 Tutorial: How to Research Your Ancestor With a No-Surname Search | Are You My Cousin? 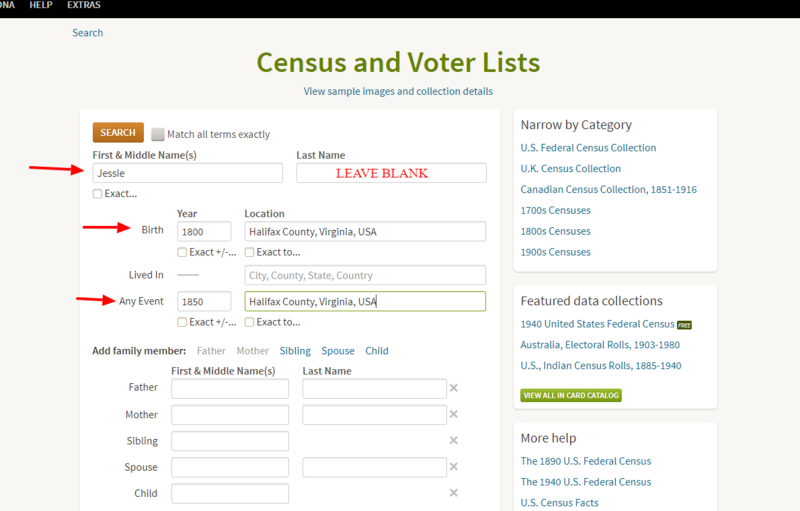 Jesse Haley of Halifax County, VA seemed to disappear from the records for a while in the mid-1800’s. Hmm….did he leave the area? Or was he just hidden in the records? Haley seems like a straight forward name to research with it most common misspelling being “Hailey”. Still, I struggled to find Jesse in the records. 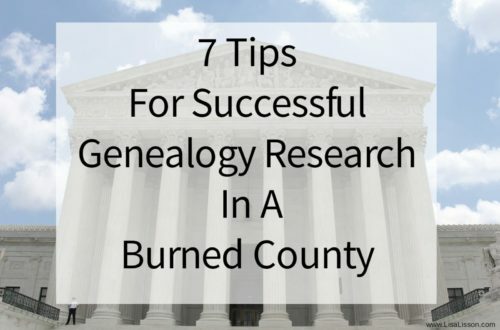 You might be not be finding your ancestor in search results for a variety of reasons. A surname may be “misspelled”. The surname was fluid. Take my Howard ancestors for example. At any time in the early records, they might be found using the name Harward, Harwood or Howard. Variations even occurred within the same document! The clerk or the person recording the record made a mistake. 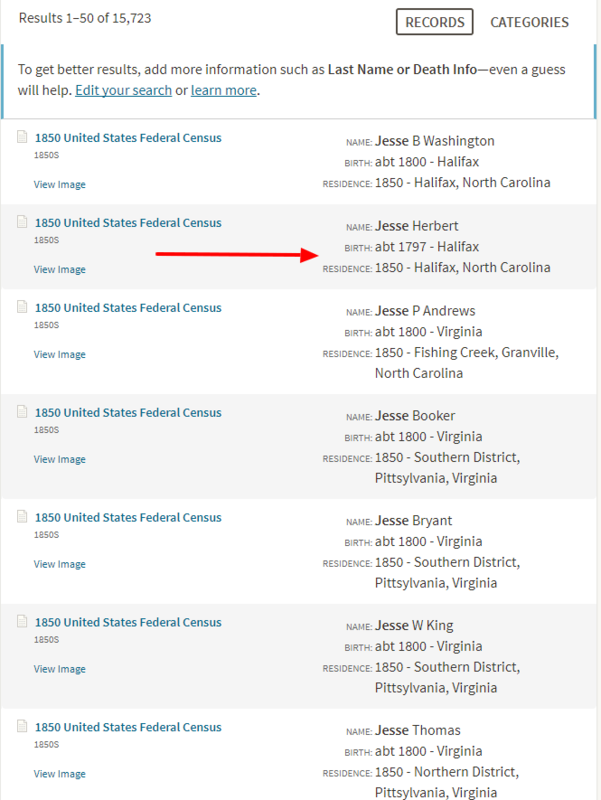 Jesse Haley was found as Jesse Hartig in one estate record. Placed alongside the other records for Jesse Haley and the rest of the estate record, the mistake was obvious. The record on its own threw me for a loop! Transcribers made an error. 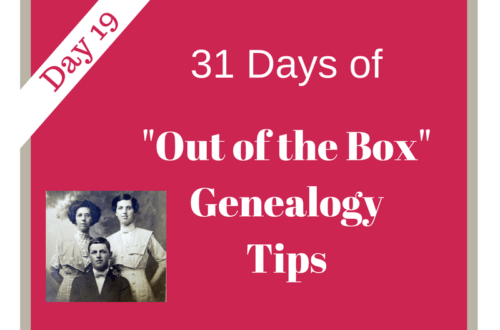 Have you volunteered to transcribe records? (If so, thank you!) You know that handwriting can be tough to read, so mistakes can and did happen. We are human, after all! Sometimes we do not know the right surname. This happens more often with our female ancestors, but certainly can happen for other reasons. 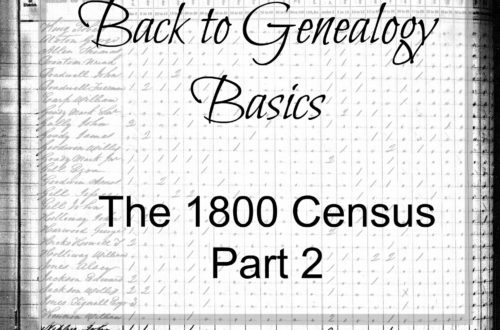 Let’s take a closer look at how to perform an ancestor search without using a surname. 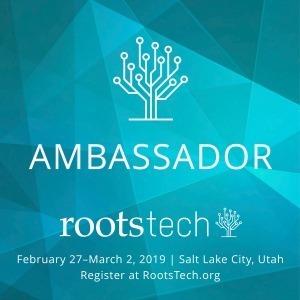 I’ll be showing examples in Ancestry.com, because that’s where I spend a lot of my research time. 🙂 The principles apply to any database you are researching. The search fields might vary, but no worries. You can still use these ideas. Start by choosing which record collection or category you wish to search. 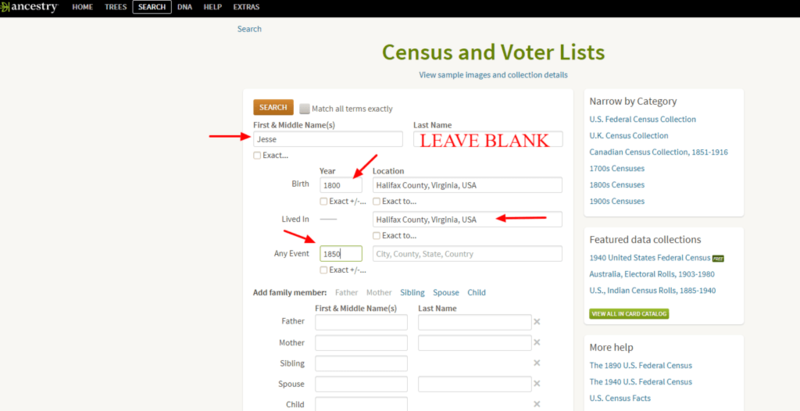 In this example, I chose to search for Jesse Haley in the “Census & Voter Lists”. Jesse proved to be elusive in the census records, but was not a man who appeared to move around much. I suspected I was missing him due in part to “mis-spellings” of his name. Next, fill in pertinent information minus the surname. 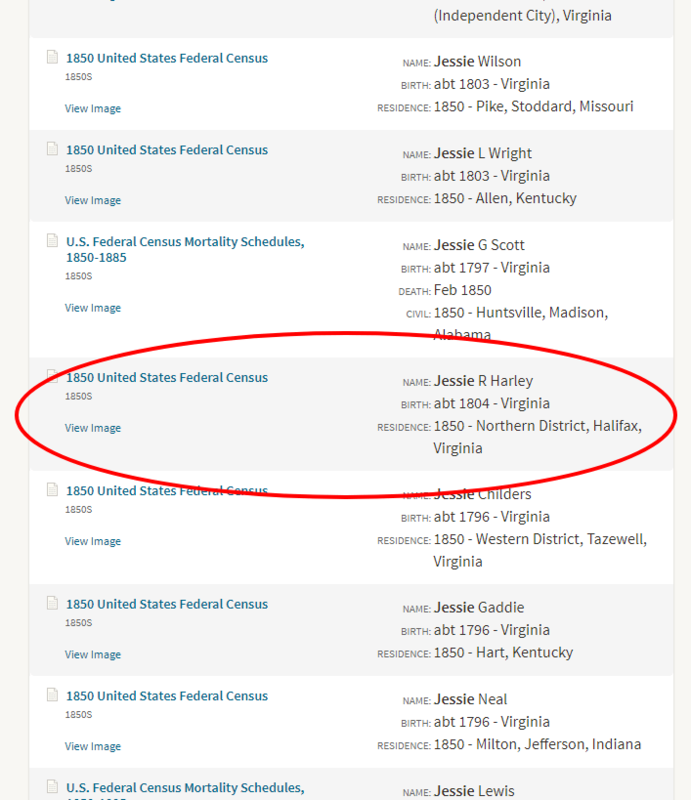 My ancestor of interest is Jesse Haley of Halifax County, VA. For this search, I included his first name, a location where Jesse lived, the approximate birth year and the county I expected he lived in. I intentionally kept my search broad to start with. Only one result – Jesse Herbert – showed any potential to be “my Jesse”. Unfortunately, Jesse Herbert was not the one. Go back to the drawing board and adjusted search parameters. In other records, I had seen Jesse spelled as “Jessie”. I adjusted my search parameters and still left the surname blank. This time…..Success! About a third of the way down on the first page of results, “Jessie Harley” appears in Halifax County. Jesse R Haley [Hailey] is just where he should be in Halifax County and living with his known wife Temperance. Haley frequently appears as Hailey in the records. 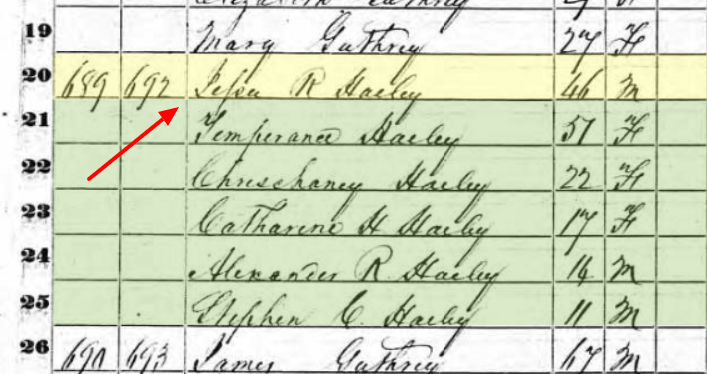 Unfortunately, the census taker did not dot his “i” leading the transcriber to list Jesse Haley/Hailey and Jesse Harley. One missing dot and Jesse was “lost” in the records! 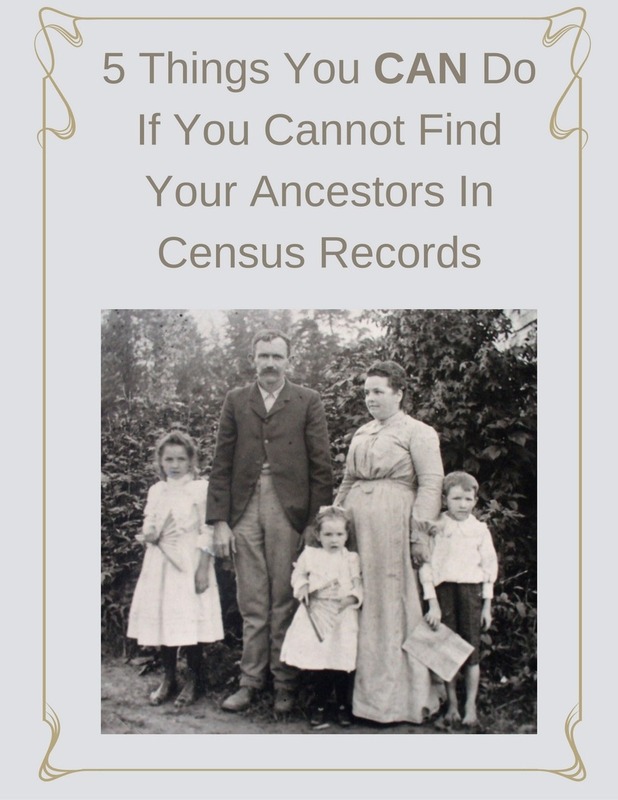 Do not assume a record does not exist for your ancestor just because he/she does not appear in the expected records. Widen your search. Perform a search without a surname to capture possible misspellings or transcription errors. 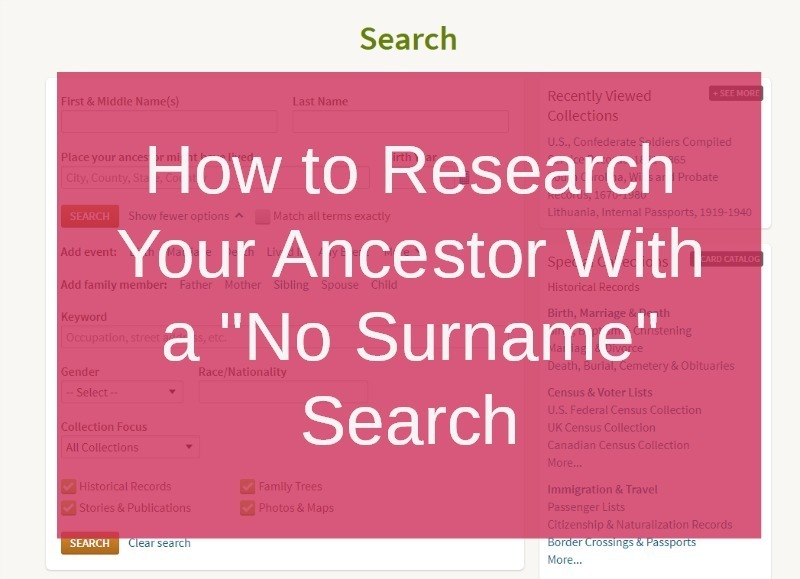 You can do similar searches using a surname and leaving a first name blank. Ancestry.com is not free. Please do not get people to sign up for a free period of time and then have problems getting it cancelled. I can not pay for information. I wish I could. 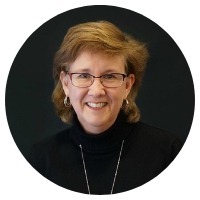 Janice, The principles for the searching without using a surname can be applied with any fee based or free genealogy database. 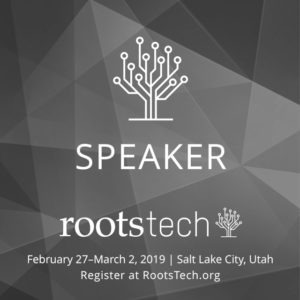 The technique or search fields may be different, but the principle could be used in FamilySearch, for example. I love and appreciate this tip and will be using it to try to find my relative that seems to have gone missing. Will you give me a quick strategy example if the first name is known by Sidney, Henderson, and SH? Surname is Hughs (or Hughes or Huse). Great question, Andrea! I would try a search with just Sidney, then try just Henderson, then try Sidney Henderson and then S. H. and then try S. Henderson and possibly Sidney H. If you know a birth date, death date or other information you can include that, too. 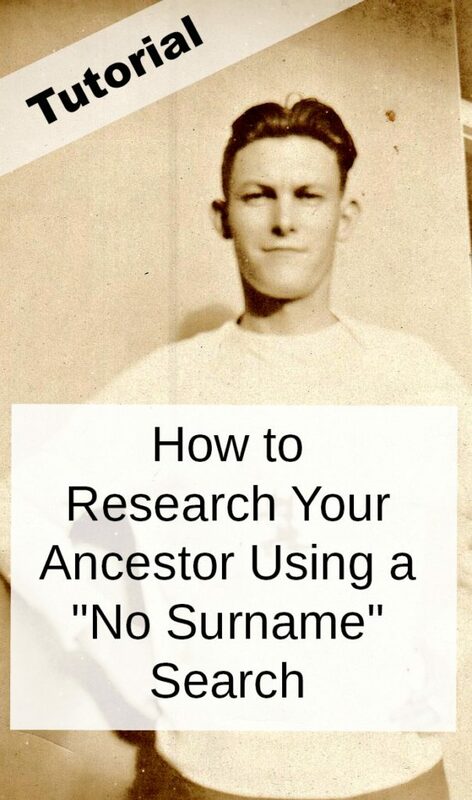 You can reverse this and do a no first name search by searching the various Hughes spellings and using the birth and death dates to narrow the field. Hope that helps! Tutorial: The Ancestry.com Member Directory | Are You My Cousin?